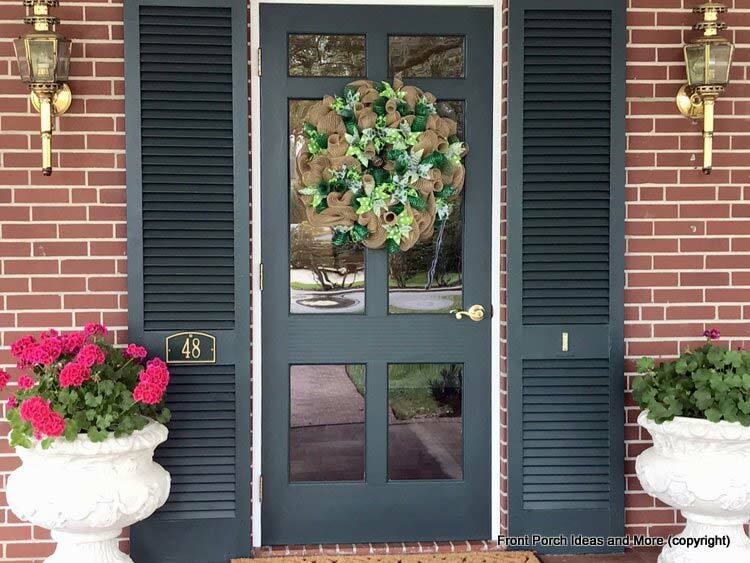 St. Patricks Day decor on our porch. 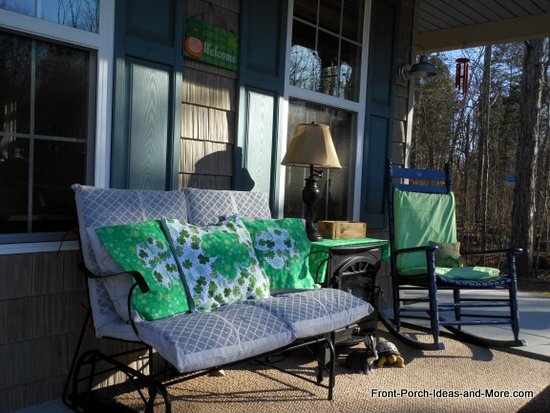 It does not have to over the top or anything, just some splashes of green on our porch glider and front door. 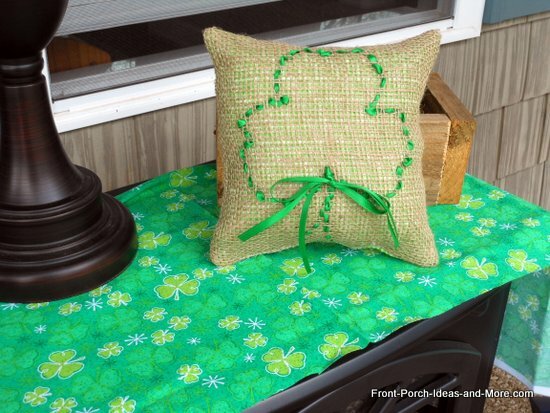 We share with you how to make our shamrock pillow toppers as well as the cute little burlap shamrock pillow. 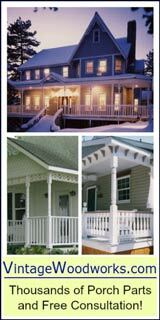 So come along and see our porch and how we pulled it together. It was easy indeed! 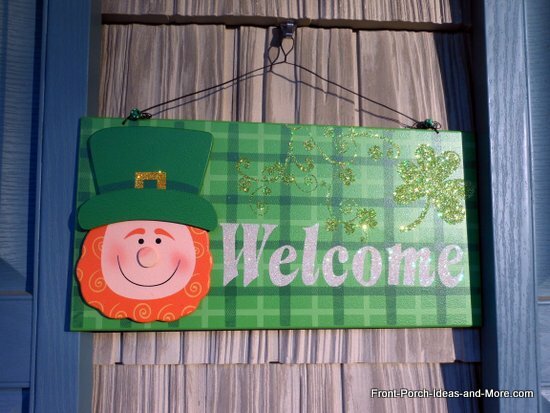 Do you like this welcoming banner and wreath for St. Patricks Day decor? 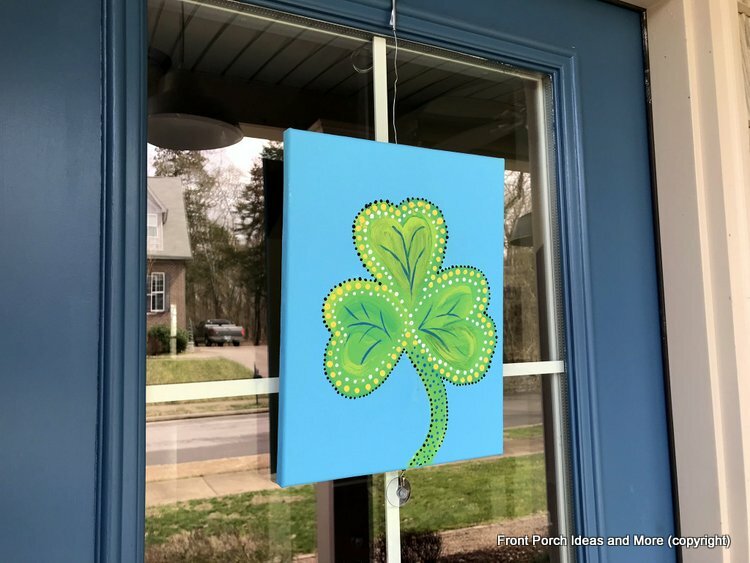 Done on an inexpensive canvas, Dave and I used acrylic paints for the shamrock and then dressed it up with paint dots using a narrow dowel. Hint: if you want anything to look more fun, just add some dots. 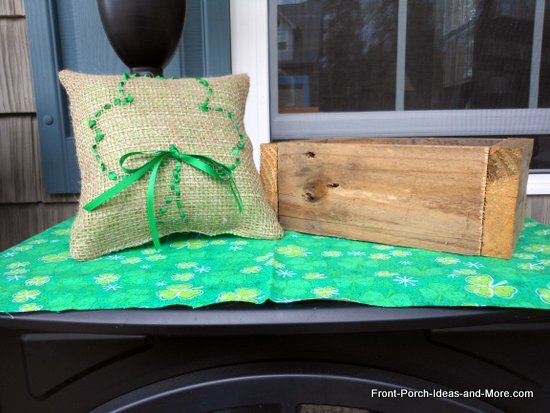 We made this sweet burlap shamrock pillow for our front porch. 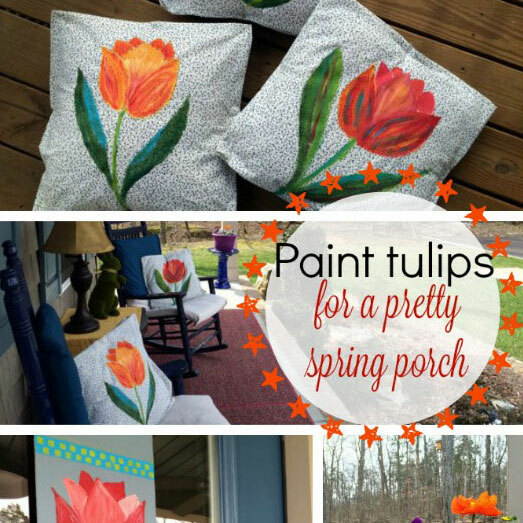 It was very easy to do and I was inspired by MaryAnn of Domestically Speaking for a similar pillow she did for Valentine's Day. 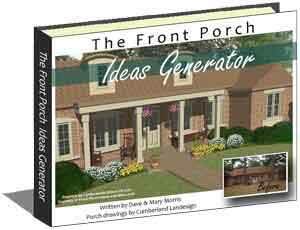 I'll tell you how it's made. I am allowing for a 1/2" seam allowance. 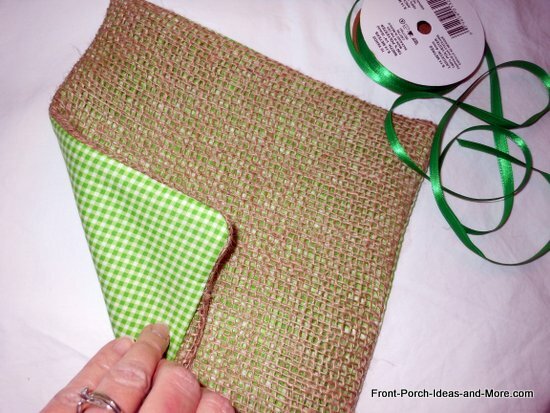 Pin the burlap to the fabric for the back of the pillow - right sides together. Notice how I made my burlap square a little larger than the front - only because it frays so much, but you wouldn't have to. 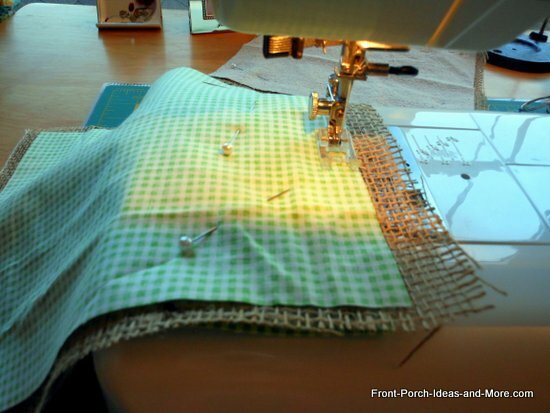 Stitch around the 4 sides, but keep an opening large enough to be able to turn it right side out. I'd recommend at least 4 to 5 inches for that. Here's how the pillow looks after it's turned right side out. 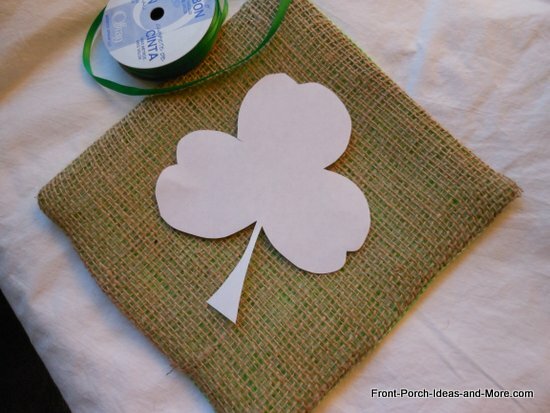 Then I placed my paper shamrock template on the burlap. 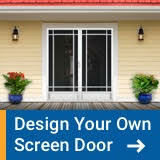 You can easily find shamrock templates online. 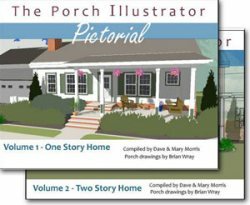 Just try coloring pages. 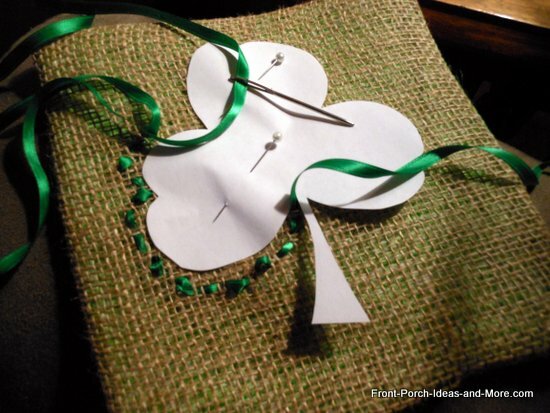 I pinned the paper shamrock to the burlap and ran ribbon in and out around the shamrock. 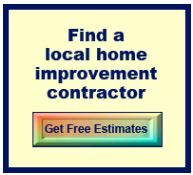 I did that by using a wide-eyed needle and going over and under the burlap. Leave a tail at either end so that you can tie a bow when it's done. Pretty sweet. 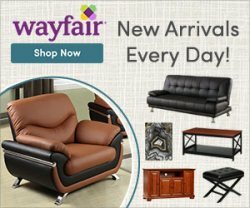 Would this fit into your St Patricks Day decor? I think it would make a nice little gift, too. I have another decoration idea for St. Patricks Day decor for you. 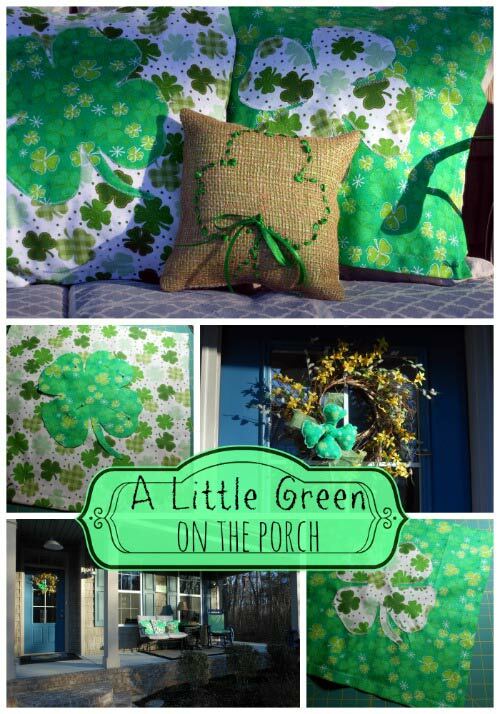 We made these three shamrock pillow toppers. They replace the valentine pillow toppers we had recently on our porch. Let me tell you how I made them. But first, just a reminder that the pillow toppers are meant to go on the top of an already finished pillow - my 17" pillows are made from drop cloths. 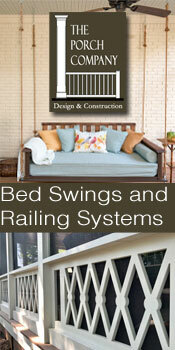 The purpose of a "topper" is so that you don't need an entirely new pillow every time you want to change your decor. 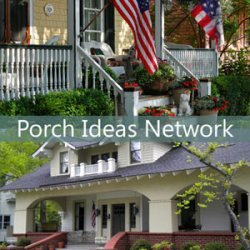 I am really loving this idea. You can see our Christmas pillow toppers here and our Valentine toppers here. 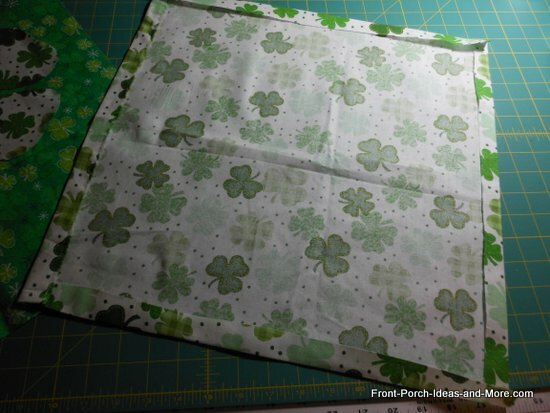 shamrock template - probably bigger than what we used for the burlap pillow. Mine is 8 to 9" across. 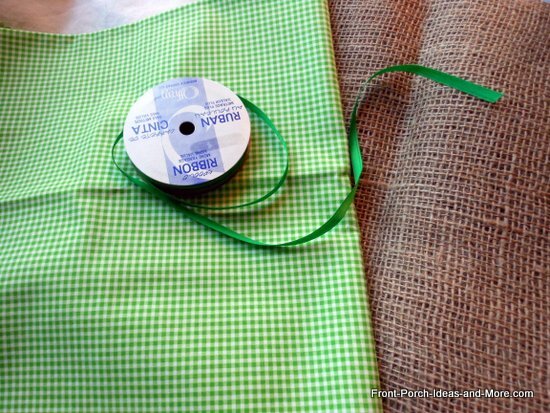 Turn the edges under on each side and hem using a zig zag stitch. 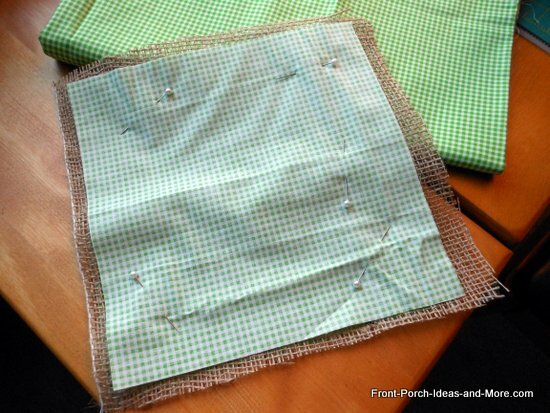 For the no-sew way, just glue the edges down. 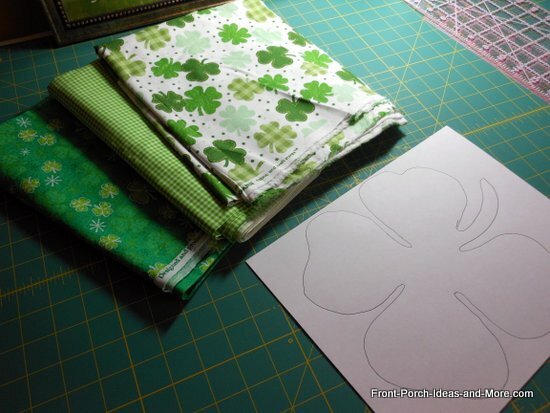 Trace the shamrock onto the back side of your shamrock fabric swatch and then cut it out. 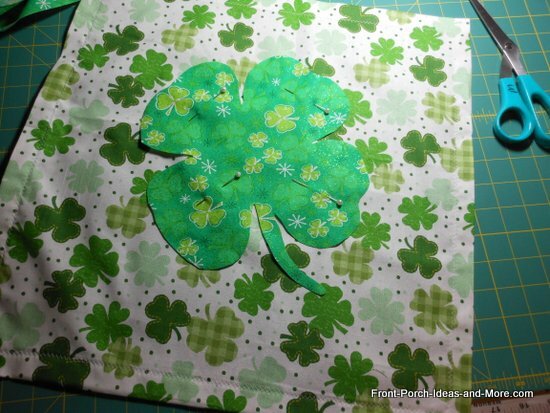 Pin the shamrock onto the front of the pillow topper. 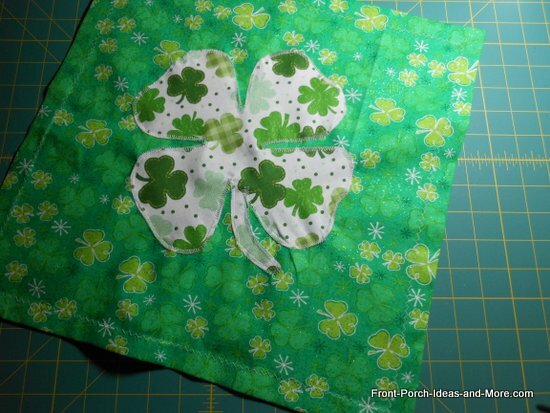 Then sew around the shamrock. I used the zig zag stitch on my machine again. 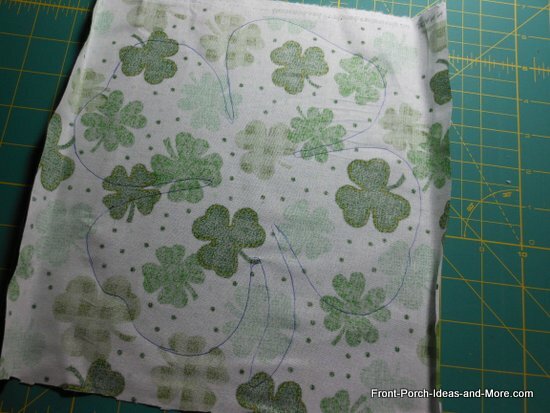 If you prefer the no-sew method, just glue the shamrock onto the pillow topper and you're done. 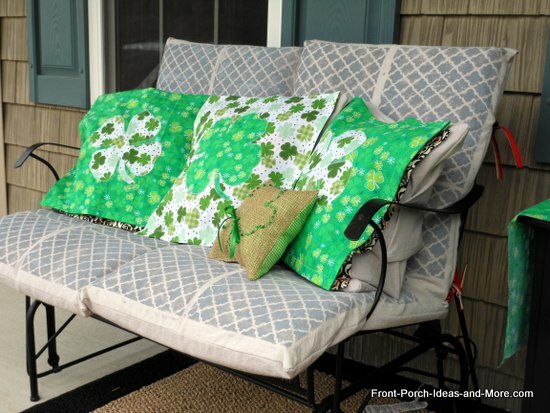 Here's our porch glider all set with our St. Patrick's Day decor pillows. 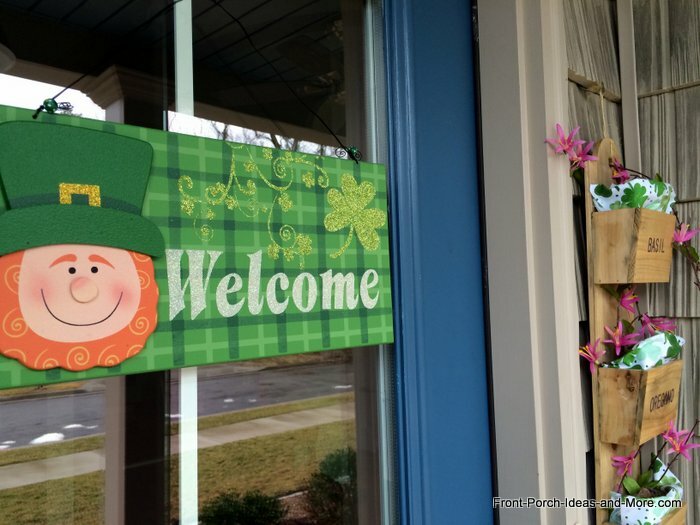 Our welcome sign - leprechaun style. 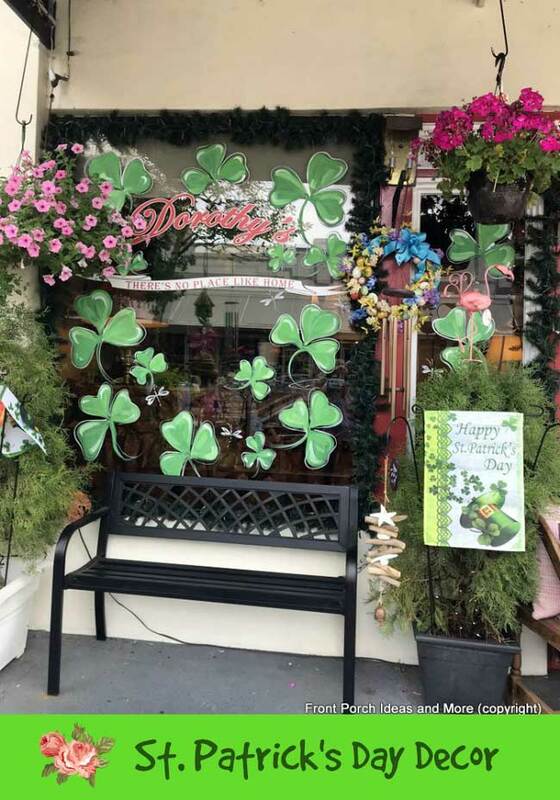 Just adds a cute touch to our St Patricks Day decor. 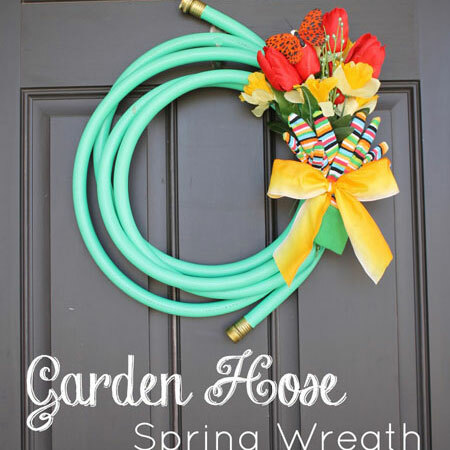 Our St. Patrick's Day wreath was simple. 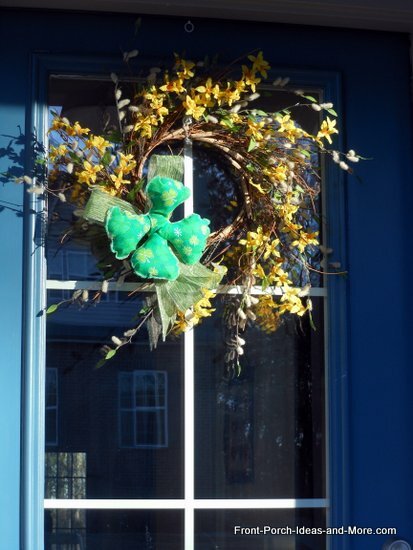 We just used a forsythia wreath we already had and I added a handmade shamrock and some green ribbon I also already had. 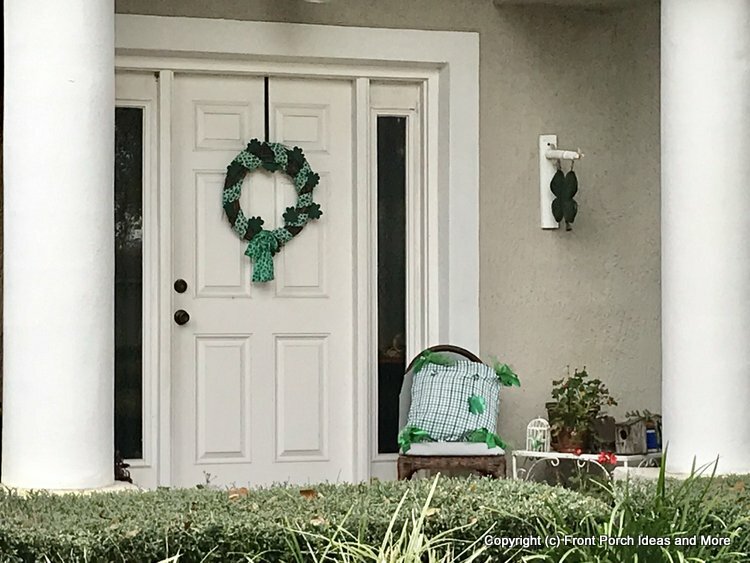 It was quick and easy to do and ties in nicely with the other decorations for St. Patrick's Day. It's not over the top. 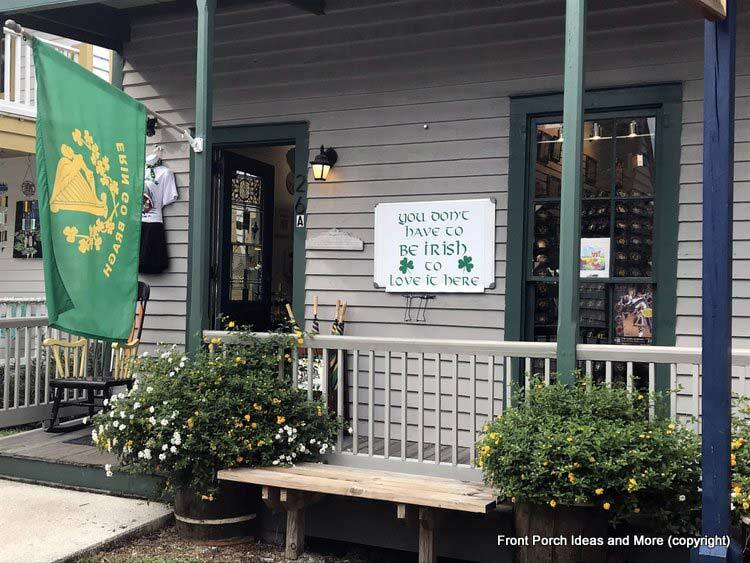 Just some splashes of green and a little luck o' Irish on our front porch. 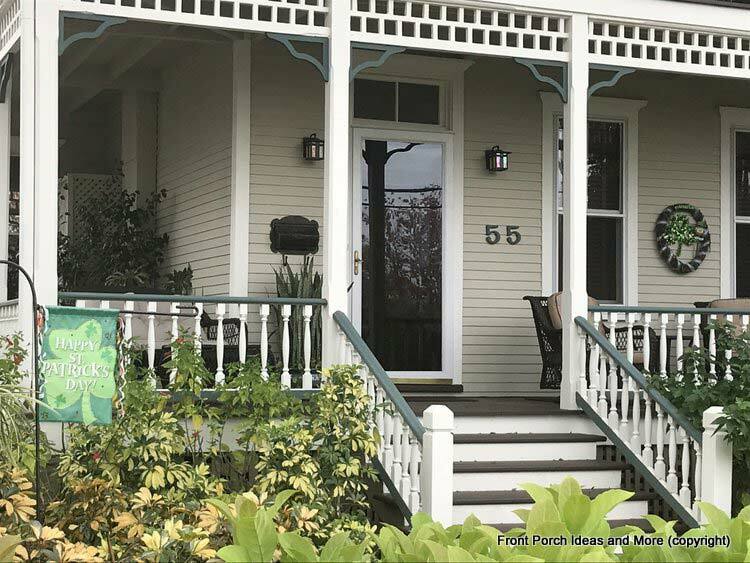 Another variation of our front door we thought you would enjoy seeing. The herb holder in the corner gets updated for each season and holiday. 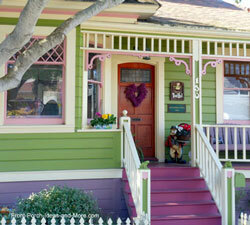 Hope you enjoyed seeing our St. Patrick's Day decor ideas.